The LBT-1477B was London Bridge Trading's take on the notorious CFP-90 pack (properly known as the Field Pack, Large, with Internal Frame, or FPLIF). Developed during the 1990s and available for sale until early 2001, the LBT-1477B was an improvement on the CFP-90 design. The 1477B added individual buckle closures to its side pocket flaps, instead of using compression straps to secure these flaps a la the CFP-90. A center front pocket was added in place of ALICE webbing, and the entire pack was built out of 1000D Cordura nylon instead of packcloth. The 1477B was available in black or olive drab as standard, though LBT offered an assortment of different colors by special order. Whereas the CFP-90 featured an aluminum internal frame, the LBT-1477B utilized a plastic external frame, which was the 27" compact variant of the Coleman Peak 1 RAM-FLX frame. It's particularly interesting to see this frame in use on a military ruck of this era, as the pack may have preceeded the similarly plastic-framed MOLLE pack, which was first adopted in 1997. The Coleman Peak 1 frame is still popular among some in the outdoor/survival community, as it was found that the frame will readily accept the MOLLE II rucksack shoulder straps and waistbelt. The final year the 1477B was available, it was sold with their ALICE frame assembly (LBT-2027) instead, possibly due to the lack of availability of the Peak 1 frame. Though the capacity for 1477B is listed as 5500 cu-in on the LBT website and 6500 cu-in from their distributor, it's likely that the 1477B is 5500 cu-in and that the recon pack is around 1000 cu-in, as this would be in line with the capacity of the CFP-90 and its patrol pack. Description and photos from London Bridge Trading website (2000). 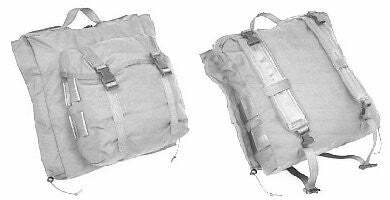 LBTW-1477B: Large Backpack with Frame (modified Coleman), volume 5500 cu. in. Author's note: The LBT-1477B was labeled as the LBTW-1477B on the LBT website. At that time, all LBT style numbers carried the "LBTW" moniker, at least on their website. This is an early desert tan example of the LBT-1477B. Note the use of commercial-spec tan webbing. This LBT-1936 recon pack was paired with the 1477B shown above. Written 13 May 2017 by Jesse Ables.